Rotterdam-based Dutch artist Arnold Schalks is one of the participants in the ArtRoPa project, and the instigator of the journal De Surinoemer. In late 2008, during his artist's residency in Paramaribo, he created Someni Tongo, a community project that centres around poetry and recitation. "Someni tongo" is a line from the poem "Wan Bon" ("One Tree") by the celebrated Surinamese poet and performer R. Dobru. Schalks interpreted "someni tongo"--"so many tongues"--as an imperative, and had Dobru's poem translated from Sranan into fifteen other languages spoken in Suriname: Arawak, Aukan, Chinese, English, Hindi, Modern Hebrew, Javanese, Kaliña, Lebanese, Dutch, Portugese, Saramaccan, Sarnami, Spanish, and Trio. Schalks incorporated the sixteen translations in a five-part arrangement for a speaking choir. The translations are interwoven in such a way that each part sheds a different light on the poem's theme, "unity in diversity"/"diversity in unity". In each part, the sixteen voice-groups (one for each language) pronounce their versions of the poem simultaneously. 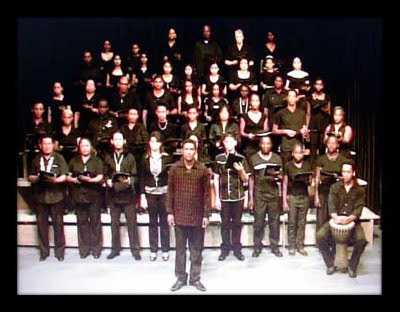 The mixed choir, composed of 43 Surinamese, was conducted by Eldridge Zaandam and accompanied by the percussionist Ernie Wolf. 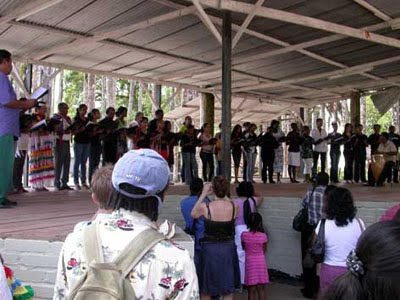 Someni Tongo was performed twice in Paramaribo: on Saturday, 22 November, 2008, at in the STVS studio, and on Saturday, 29 November 2008, in the Palmentuin. Schalks also produced a limited-edition DVD documenting the project in still and moving images. "What I like about Dobru's poem is that it initially appears to be simple, something that must have been made with great ease. But if you look closer, you see a tremendously ingenious, sophisticated poem. I parsed it with respect, and tried to find just the proper visualisation of it. 'Someni tongo' was my starting point. Once you have so many languages, you also need people who speak those languages. And if these people finally line up, then 'someni prakseri', 'someni wiwiri', 'someni skin' but also 'wan pipel' suddenly become visible. You're looking at a sculpture. The perfect visualisation of the poem." --Arnold Schalks, interviewed in November 2008 on the Skrifiman Taki ("Writer's Talk") radio programme, SRS-radio. For more information about Someni Tongo, including the names of the participants in the performance, see Arnold Schalks's website. Er, Nicholas, the poem is called Wan bon (One tree), not Wan, and it was originally written in Sranantongo, so it seems a little odd to me that it was translated into it! I met Dobru at Carifesta 76. He was an extraordinarily modest man. He needed to get from the Mona campus to the National Arena, and when I (as Mervyn Morris's gofer) took him over to the campus coordination centre and explained who he was, and that he was a member of the Surinamese parliament and consequently a VIP. He kept trying to downplay his status. He charmed a friend of mine a couple of years later, simply by reciting his poetry on a voyage from Cuba to Jamaica. Thanks for this note, Fragano. "Translated into ... Sranan" was a slip. I've corrected that--also the title. Glad you have such sharp eyes! You have a sharp eye, but I was informed several times during the last years that the original title of the poem is Wan, and not as almost everybody calls it, Wan bon. Because it is about so much more than "just" one tree. Hi Nicholas, first of all, I'd like to say, that I'm a little disappointed by the superficiality of the comments on the Someni tongo project. To put one thing right: Shrinivasi, the grand old man of Surinamese poetry included Dobru's poem in his unpeered 1970 collection of poetry 'Wortoe d'e tan abra', with the title: 'Wan'. If anyone, he should know. Apart from that, it is comprehensible that many will refer to Dobru's poem with its first line, 'Wan bon.' There's nothing wrong with that. Secondly I sincerely hoped for comments on the project that would venture more deeply into the multi-racial, multi-cultural, and multi-lingual aspects of the community project and the present Surinamese reality beyond the words of the poet. I don't want to sound immodest, but Someni tongo was an unprecedented event of historic proportions. It was the perfect example of teamwork. I still feel touched and honoured by the participants unconditional faith and trust in the project, which enabled us to show the ideal visualisation of Dobru's poem. I still admire the courage of the choir members, bridging the gap of ethnicity with great ease and naturalness, but most of all, enjoying doing that. Thanks for your note, Arnold. I think Someni Tongo is a moving and important piece of work, and I hope that including it in this blog will bring it to the attention of a wider audience. I'm sure that in the coming days and weeks we'll see further comments about the project. The ideas you engage, the questions you raise about ethnicity, identity, nationhood, language, performance, and the relations between the visual and the literary are all deeply relevant to the wider Caribbean region. No problem Arnold. I first encountered the poem on the wall of a fellow student at Mona. A Jamaican from St Thomas (the parish in Jamaica, not the Virgin Island) with the surname of Bogle (and thus a relative of the National Hero, whom he resembled). The poem makes a statement, it seems to me, about something that isn't very fashionable today, the Creole identity of Caribbean people. It's something that's found also in the Surinamese national anthem, and in other proud assertions of nationhood across the region. It's something that many in the region have wanted to abandon in exchange for a poorly imagined Africa, or India, or even Indonesia. But, oddly, the actual dream seems to be America, or Canada, or Britain, or France, or Holland, or Belgium, or even Australia. Anywhere but the "ancestral homeland". But the idea of building a homeland out of the many skin colours and hair textures, one tree out of the many leaves, is not one that contemporary leaders seem to want Caribbean people to pursue. Yet that ought to be our thing.